EDITOR’S NOTE: This story appears in the May edition of Women’s Pro Rodeo News, the official publication of the WPRA. Lary and Basia Benbenek were young newlyweds when they packed up their city life and moved to the country. There was a fondness for the expanse that is Missoula, Mont., which is so much different than the life they knew so well in Chicago. It was attractive and open, and it was nestled among the Lolo National Forest near the state’s western edge. A trip to visit family resulted in a lifetime change. It’s where their children, Hilary and Gretchen, were born. “My dad’s sister had moved out there,” Gretchen Benbenek said. “They came out to visit and fell in love with Montana. They were 19 years old. No, she didn’t; that’s a good thing. Her parents found her a job so Gretchen could work with horses, figuring the labor might be a bit overwhelming for the young lady. After three years of cleaning up horse manure and tackling the most menial of tasks, Gretchen Benbenek was more horse crazy than ever. On Saturday, April 12, she put all those years of hard work and equine passion together for a national championship run during the final go-round of the Ram National Circuit Finals Rodeo at the Lazy E Arena near Guthrie, Okla. It was a season-changing event – maybe even a life-changing event – for the young cowgirl now living in the horse-country community of Aubrey, Texas. 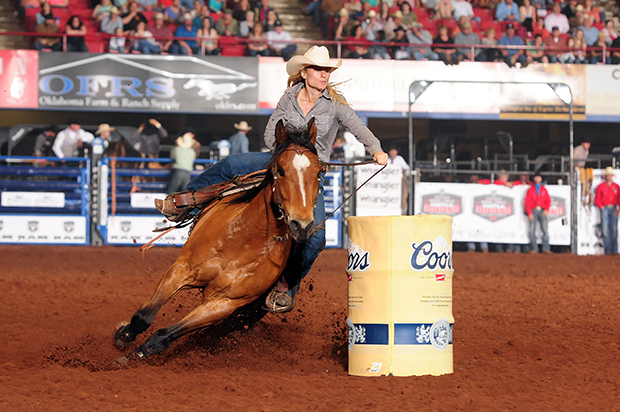 Not even the $13,025 she earned inside the Lazy E will count toward a Wrangler National Finals Rodeo qualification, but it helps in many ways in regards to entry fees and expenses that go along with traveling the rodeo circuit full time. Along with the national title comes an automatic qualifier to the Calgary (Alberta) Stampede. She should. The historic rodeo north of the border features just a handful of barrel racers. Money won in Calgary will count toward the WPRA world standings – the winner will be awarded $100,000, and $50,000 of that will count toward Wrangler NFR qualifications. “To only be competing against 20 other girls is a heck of an opportunity,” she said. Benbenek has had a number of opportunities over the years, but they all seem to have been the perfect stepping stones to chase her gold buckle dreams in 2014. It all started with a watchful eye for the grace and beauty of horses that turned into a lifelong passion. She competed in high school rodeo, all while working with Ron and Vicki Kellum on technique and horsemanship. Her senior season, Benbenek won the Silver State Rodeo’s barrel racing crown. She also qualified for the National High School Rodeo Association Finals in pole bending. That horse was Miss Willie Ada, a mare that was just 3 years old when Benbenek got her. The Kellums thought Miss Willie Ada was the perfect fit, and she was. When the Kellums moved to north Texas, Benbenek eventually followed. When it was time to further her education, she began contacting colleges in the region. The late Terry Hyman was the rodeo coach at Oklahoma State University, and he added Benbenek to the team. It paid off quite well; OSU won the women’s National Intercollegiate Rodeo Association titles in 2001 and 2004. Upon graduation, she returned to north Texas, where she is a real estate appraiser for Merit Advisors in Gainesville. She also has maintained her place in the Prairie Circuit. She parlayed a cherished regional title into a coveted national title and all the perks that come with it, including a $20,000 voucher for a new Ram truck, which will come in handy. The new rig will get plenty of use in the months to come. The route to Las Vegas and the Wrangler NFR is scattered all across North America, so Benbenek will venture to parts unknown and see what happens. She’ll also haul A Shot of Firewater, an 11-year-old bay gelding by Firem Jet and out of Benbenek’s mare, Miss Willie Ada. Inside the Lazy E, Benbenek placed in the opening round and the two-run average to qualify for the semifinals. In the round of eight, New Mexican Kassidy Dennison won the round with a 17.41-second run, and Benbenek was second, just one-hundredth of a second behind. She then posted the second-fastest run of the weekend a 17.13, to win the national title. “Maverick was very consistent in the first three runs, finishing in 17.4,” she said. “I knew that level of competition in that situation was going to be faster. I’m pretty good about not letting the weight of the situation get to me. I was just trying to ride him correctly. Where he came up with that extra fire, I don’t know. Now she hopes that consistency pays off with her strongest season to date. It’s like she’s living a dream in the world of rodeo. She will get her chance soon enough.